All hands on deck at Equine Productions this week for what has to be one of the most prestigious highlights in the British racing calendar – Royal Ascot. Kicking off the summer season in style, the team at Equine Productions have demonstrated their range of specialised techniques in all forms this week, from a live broadcast at Goffs London Sale, a heart-warming win captured by JockeyCam Live at Royal Ascot, to the filming of a new brand film for a major equestrian clothing company. 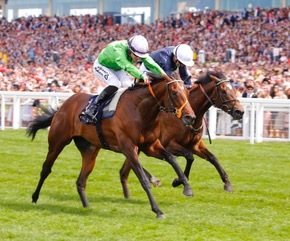 The Goffs London Sale is an annual occasion offering potential owners from around the world the opportunity to buy top-class racehorses, or even the chance to buy a runner ahead of Royal Ascot. Set amongst the stunning grounds of Kensington Palace, with champagne flowing and fine food from Selfridges, the glamorous event certainly lives up to its royal setting. Taking place just ahead of Royal Ascot, the Goffs London Sale is also known as the unofficial pre-launch of the highly anticipated international event. This year Equine Productions was fulfilling three roles: the pre-event live big screen broadcast; a live stream of the sale across social media and Youtube; and a high-end review film post-event that was shown at Royal Ascot. The team thoroughly enjoyed working with presenters Mike Cattermole and Hayley Moore for the live broadcast – reporting on all the action and offering guests insightful interviews with trainers, breeders and agents throughout the day. JockeyCam yet again startled audiences by capturing one of the most emotional wins of the week. Arthur Kitt followed in his mother’s footsteps for a fairytale success in the Chesham Stakes. His mother Ceiling Kitty who won the Queen Mary Stakes in 2012 died giving birth to the Camelot colt, who himself had to be resuscitated six times before being adopted by a foster mare. Providing JockeyCam Live footage on behalf of ITV Racing, Equine Productions was delighted to be able to share and capture this special moment for all associated with Arthur Kitt. JockeyCam was also placed on two of the stall handlers at Royal Ascot, providing a unique perspective on the important and sometimes dangerous job these guys do behind the scenes. Global equestrian clothing and equipment company Horze approached Equine Productions to create a lifestyle brand film with the aim of capturing the eyes of riders around the world. The film follows a family hack through the beautiful mountain range of the Brecon Beacons in Wales. Featuring stunning drone scenes and spectacular views along the way, the film offers the perfect display of clothing and equipment offered by Horze. Many thanks to Lucinda Green who offered her wonderfully well-tempered bay hunters for the shoot, and to Siobhan who looked after them so impeccably. A huge thank you also to those at Llangorse Multi Activity Centre, Ty Mawr Lime Ltd, Glanusk Estate, and to models Carrie Campbell, Tilly Dowsing and Alex Broome who were handpicked especially out of over 400 applicants. Photographers Sarah Farnsworth and Adam Godley also provided some stunning photos from the day. Watch this space for more on this beautifully crafted film coming soon.